It is crazy to think that football has not always been part of my life. I spend so much of my time on the pitch now that it feels like a different life when I didn’t play this game. Now you will struggle to find me without a ball at my feet and my cleats nearby just in case someone wants to play. But where I’m from this is not always an option. In my village, many people only recognize the traditional way of life. They do not like people breaking away from the normal system and trying to be different. For women, that severely narrows the possibilities for achieving a fulfilling career or life. If girls in my society want to go to school, they have to go to a government school, whereas boys go to private school. When boys grow up, they are expected to be smart and rich, and are given the responsibility to take care of their parents. A daughter is expected to move into her husbands home and support him, and there is little choice in the matter. From a young age, daughters are taught a certain type of work — girls work. We are taught to wake up early and do all the house chores, like sweeping rooms and preparing breakfast. In the evening, we must do it all over again. Sometimes we go to bed after feeding our family without even getting to eat ourselves. We can’t talk out loud when we are angry because we are girls and we have to keep our voices down. We have to listen to our elders even if they are saying something that is not good for us. In this system, people think girls can’t do the same things as boys. A girl can’t be strong or fight back. People have this mindset which forces girls to not make their own choices and have their own dreams. I have always rebelled against that mind-set. Since a young age, I have looked for ways to be free and express myself. My mother had suffered from that system, so she has always been very supportive of the decisions that I make. When I was eight years old, my cousin introduced me to a programme called Yuwa. 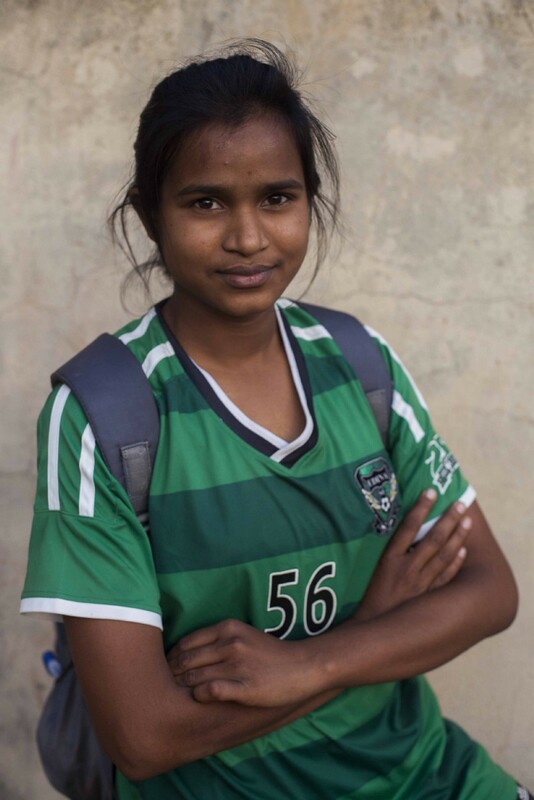 They focus on bringing special education to girls as well as opportunities to expand football skills. I joined, and this is when I quickly fell in love with football and the lessons my coaches were teaching. As I grew older, I began to shift from a participant to a leader in the programme, and my responsibilities grew. After a short time with Yuwa, I began to train as a coach. One of the highlights of my training was that I got to go to a coach training conference in Spain. I was trained on how to assist other coaches, review their sessions and discuss how they are doing with it. I now get to help coaches understand what they did well and what they can improve on in the future. I have found attending Yuwa workshops extremely helpful in developing my leadership skills. Because of my involvement, I now have the opportunity to lead workshops about many topics. For example, I love to talk about hygiene, good leadership, career development, and the benefits of education with girls. In one of my favourite workshops I was trained to lead a menstrual hygiene programme. I learnt how to talk about the subject and how to teach girls about the importance of their own personal health. Through football, I am now coaching younger kids on all sorts of different life skills. I have been given more responsibility to take care of them and make sure that they are learning and having fun. I do sometimes face challenges, like when a girl’s family doesn’t let her come to practice. When that happens, I visit the girl’s home and try to help her parents understand the importance of playing the game. Sometimes they understand and sometimes they don’t, but I always stay in contact with the girl and give my support in any way that I can. Today, I play football on one of the Yuwa teams, the Superqueens, several times a week. I love playing because whenever I feel stressed about studies, family matters, or really any issue, football gives me the solution. By playing with my friends, kicking the ball hard, running up and down, and meeting friends in game and telling some jokes, we all smile and laugh. When I play and chat with friends, I feel more happy and relaxed. One of my goals is to help my girls reach that same level of energy and excitement that I get every time I play football. I have benefited from playing football because it has shown me that I can have many different dreams and opportunities. Before football, my dreams were to become a good housewife, a tailor, or a nurse. I never truly wanted those things, but my community has convinced us that that was the only path we could take. Football showed me there are more directions that my life can take than just being a housewife. Football has given me the strength to fight for my rights and enable me to do anything. In life, I have learnt that you fail and succeed many times. But when you fail, you have a chance to keep your heart calm and patient. You have to build positive determination from the failure and find power in yourself. With these powers, you need to stand strong and to fight back whenever you face serious struggles. By doing this, no matter how big your failure, you will always be a winner.